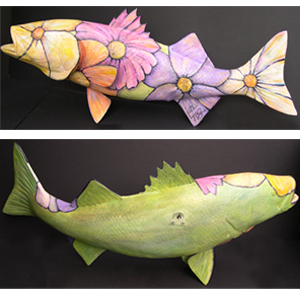 In 2011, the Cultural Center of Cape Cod asked 25 Cape artists to transform a 34-inch fiberglass striped bass into their own work of art. Kathi wrote this poem and created her “Magical Fish”. After being on display at various Cape Cod locations, the fish were auctioned and close to $20,000 was raised for the new educational wing of the Cultural Center of Cape Cod. 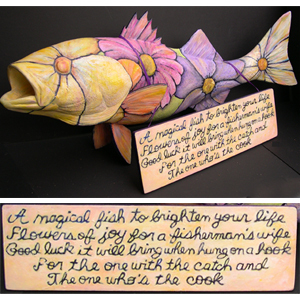 Final Magical Fish (acrylic on fiberglass) and close up of Kathi’s Painted Poem (acrylic on wood). Poem was hung over the fish with a purple ribbon.